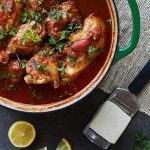 How this website has existed for over 5 years now and I haven’t yet shared this recipe, is beyond me! 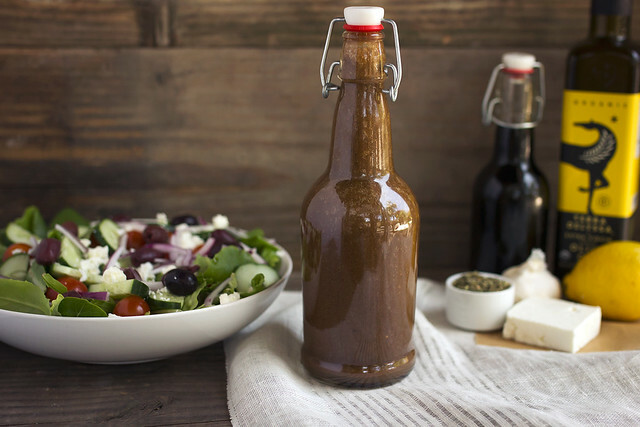 My Dad’s world-famous Greek Salad Dressing recipe is notorious among anyone who has ever tasted it. There is perfection in it’s simplicity, a recipe that after you’ve made it once, you will wonder why you haven’t been making it for years. 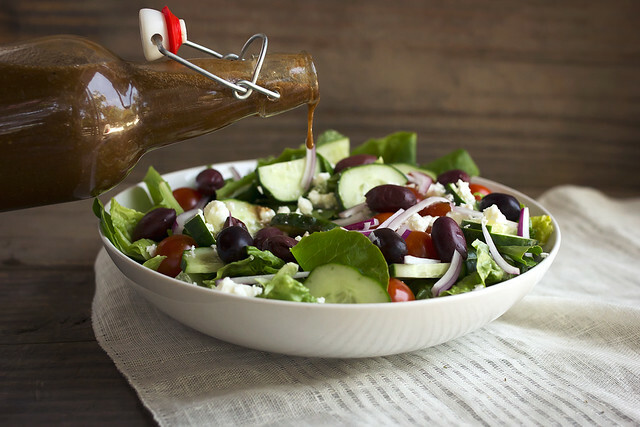 I have seen many overcomplicated recipes for Greek salad dressings, but listen to me folks, there is no reason to reinvent the wheel or to add extra flavors where they aren’t needed, AKA Keep it Simple, Stupid. Not only will my dad share this delicious recipe with anyone who asks, but he so generously allowed me to share it here on the website. I feel like I am sharing a family secret here. 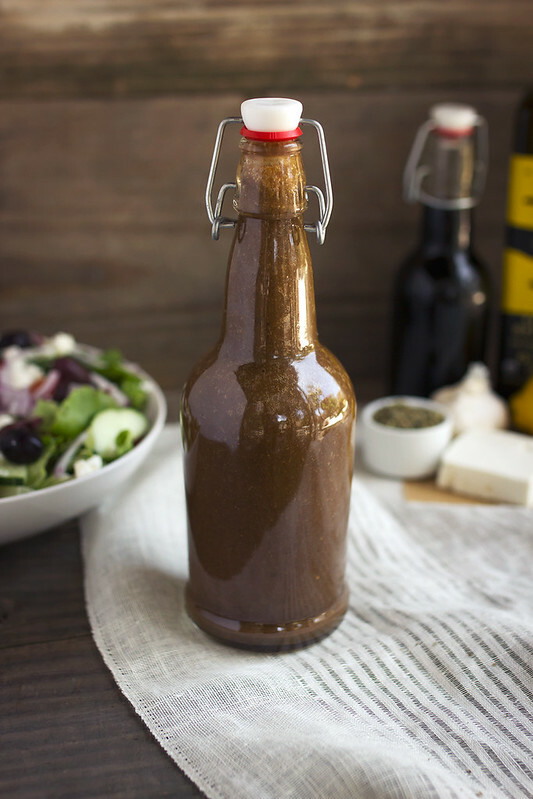 I grew up enjoying this dressing on every salad, with every plate of homemade souvlaki and now it’s a favorite in my own kitchen. During my parent’s visit last week, we of course, had our typical Sunday night Greek dinner, a tradition in our family, which I miss like crazy. Our feast was complete with grilled leg of lamb, roasted potatoes, homemade dolmades (tutorial coming soon) and a huge Greek salad. Dad and I made a batch of this dressing together for the salad and I love that he has made it so many times he doesn’t even have to measure any more. He get’s the oil to acidity ratio down and the rest just gets tossed in, basically by sight. A little whirl in the blender, a taste and he can tweak any little details from there. My dad always says the key is no matter how much you are making, sticking with 2 parts oil to one part acid (and for the acid, 2 parts vinegar to one part lemon). 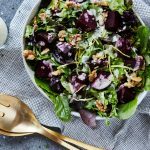 You can opt for balsamic vinegar or red wine, but I have to say this dressing really shines with the rich balsamic. The feta cheese is optional, so if you are vegan or have to avoid dairy, it is still delicious without it, but I have to highly recommend it. The creaminess, the salty, tartness. It’s so good. Seriously, you will want to enjoy this dressing with a straw spoon. This dressing gets better and better the longer it sits, so make it a day or two and really be wowed. 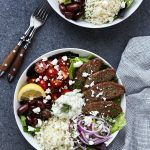 Top your favorite greens with fresh tomatoes, cucumber, kalamata olives, feta cheese, red onions and whatever else you like. 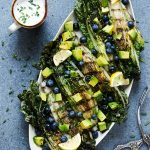 BONUS: use this dressing as a marinade for chicken breasts to turn your salad into a souvlaki salad. Add all of the ingredients to your high speed blender. Blend until well-mixed, smooth and emulsified. Give a taste and adjust your seasonings as necessary. Store the dressing in the fridge. Take the dressing out of the fridge 10-15 minutes prior to serving, to warm up the solidified oil or simply run the jar under warm tap water. I make a quart and a half at a time and it keeps for weeks in the fridge, unless we’re having chicken souvlaki. Then it’s gone at one meal! Hey Lisa, I was gonna say about 10-14 days, but I know my dad keeps his for a couple weeks and it’s always been fine. I always bought salad dressings. 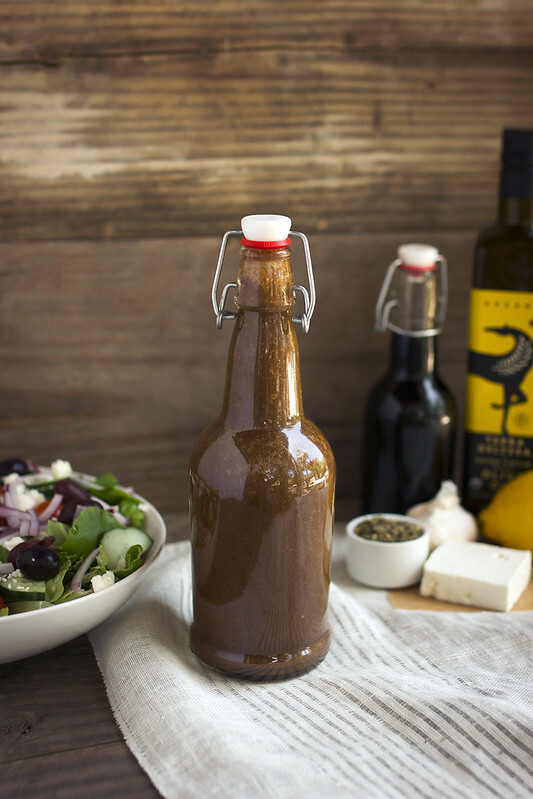 Your dad´s recipe is my chance to make my own salad dressing. I´ll try and send to you a photo! Does your family make the dolmades with avyolemeno? Having been spoiled by my mother’s I rarely see it made her way. It’s too bad because once you have the trick down it’s soooo delicious. Kali oreksi! Hi Best (and Jim), this was delicious! I just made a quarter batch for lamb gyros salad last night and am now wishing I’d made more. The only balsamic I had was a slightly sweetened balsamic glaze I’d made for another recipe which worked perfectly.